Every business has employees that fill several different roles. They can range from part-time to full-time, hourly versus salaried, front of house versus back of house, etc. To accommodate the variety in personnel, Revel is able to discern between the various roles and assign specific wages to individual employees. 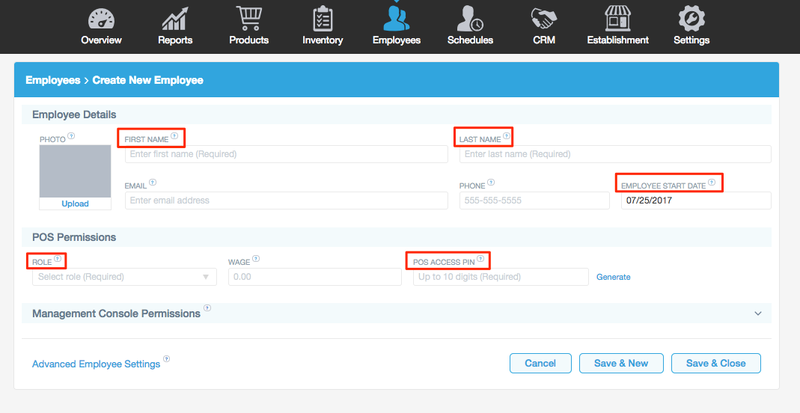 In the Management Console, click the Employees tab. First Name: The employee's first name. Last Name: The employee's last name. Employee Start: The first day the employee can have access to the system. Initial Role: The role the employee will be assigned. PIN: the unique 4-10 digit PIN the employee will use to log in to the Point of Sale. Email Address: Enter a valid email address if you want to send schedules to your employees via email. Starting Wage: Enter the employee's hourly wage if you are using Revel's Payroll functionality. Make your changes and click Save. button. 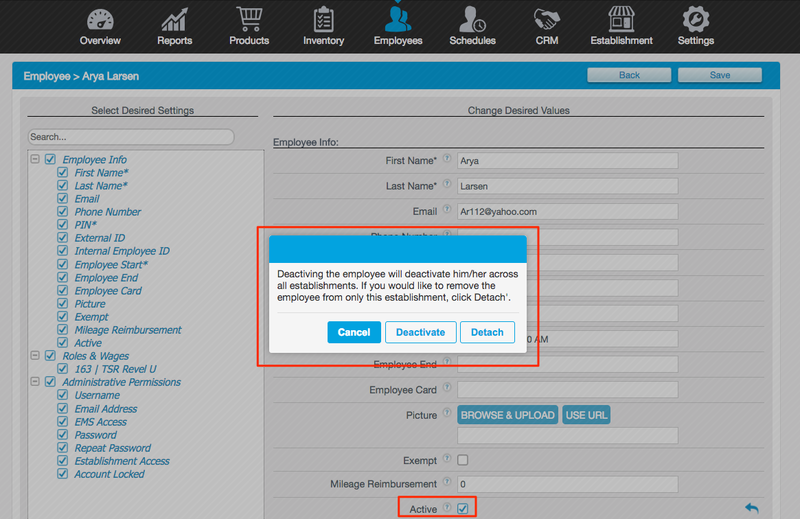 If you need to remove an employee from your system, you can deactivate them, rendering them unable to access the system. Follow steps 1 and 2 of the above section. Former: Employees whose Employee End dates have passed. Unassigned: Active employees who are not currently attached to an establishment. Scroll down to the Roles & Wages section. To edit an existing role or wage, click the Role drop-down box and choose the correct role or enter a new wage into the wage field. To add a new role, click + Add Role. Click the Choose Role drop-down box and select the correct one. If applicable, fill out the hourly wage. Please Note: For salaried employees, leave this field as 0. Go to the establishment you want to link to existing employee. Please note: If an employee is linked to multiple establishments, they’ll only be allowed to clock in to one establishment at a time. Ex: They will have to clock out of Establishment A in order to clock into Establishment B. If you want your employee to be clocked in to more than one establishment at a time, they’ll need to create a new, unlinked employee with a separate Point of Sale PIN per establishment. On the Management Console, open the Enterprise from the Establishment Hierarchy Tree. Check the box in line with the employee profiles you want to merge. Click the employee profile you want to keep. The other will be merged into it. Click Merge.